The Swimsol story began in 2007 when Michael Tittmann, one of Germany’s solar pioneers from the early 1990s, met Martin Putschek and the two decided to go international. In the years to follow, the newly founded Tittmann Solar International implemented solar rooftop systems and designed large-scale power plants across Europe. In 2009, while visiting the Maldives, the two of them got inspired to create a floating solar solution that would take solar power beyond the limitations of land and tackle some of the most pressing ecological problems of remote tropical islands. In remote tropical islands, such as Maldives, French Polynesia, Fiji and many off-grid coastal regions, electricity is primarily produced with diesel generators. A typical Maldivian hotel island for instance consumes 2,000,000 liters of diesel annually, while the country of Maldives spends 25% of their GDP on fuel imports. Such means of energy production create a heavy financial, logistical and ecological burden. In the tropics, Solar PV electricity is cheaper than diesel power, however solar panels require a lot of space, and the inherent land scarcity prevents large scale solar expansion in most islands. Swimsol was founded by Martin Putschek in 2012. Two years later, in cooperation with the Vienna University of Technology and the Fraunhofer Institute in Germany, they launched the world’s first floating solar power plant for the marine environment – SolarSea. Moreover, they succeeded in making it less expensive than diesel-generated electricity, a precondition for a gradual replacement of diesel generators through clean solar power solutions in those regions. 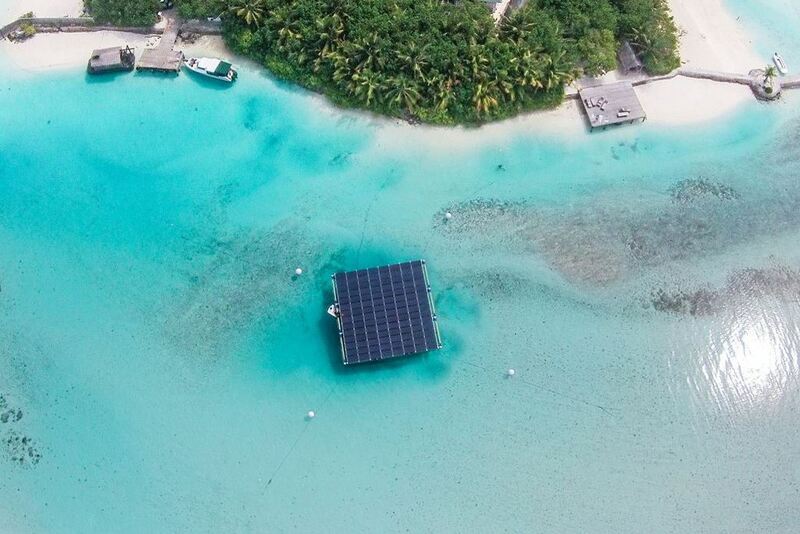 By using the free space on the water, the technology makes large solar systems possible even for islands that do not have enough roofs or land for solar panels. Their floating systems are currently operating in the Maldives and demonstrate great potential for other marine regions. One SolarSea platform, as seen in the picture, annually prevents burning 12 000 l of diesel for generators and can supply 25 households with clean and up to 50% cheaper energy. In the long run Swimsol can make clean energy possible for over 360 million people living in remote tropical islands and crowded coastal cities.